Please see below for notice of this year’s Hazlitt Day School, which will take place in London on October 10th. As usual, some excellent speakers. The 2015 Annual Hazlitt Lecture and the 14th Hazlitt Day School will this year be dedicated to Hazlitt’s journalism, and will take place at University College London on Saturday 10 October 2015. The Annual Lecture, entitled ‘Hazlitt’s Political Hatred’, will be given by Kevin Gilmartin of the California Institute of Technology from 4pm at the Gustave Tuck Theatre, UCL. Attendance is free of charge. The Day School precedes the Annual Lecture from 9.30am and provides a rare opportunity for readers and scholars of Hazlitt to explore a whole range of topics relating to Hazlitt and Journalism, as well as to meet each other and exchange ideas. Ian Haywood will give the opening lecture, and shorter papers will be delivered by David Higgins, Lucasta Miller and Ruth Livesey. A small fee applies for the admission to the Day School (£20/£15) which includes morning coffee, lunch and afternoon tea. Please see below for a Call for Papers for an exciting-looking conference on Europe and English-Language Gothic, which will take place in Leiden next June. We have written before about some of the many difficulties involved in identifying writers published in the Lady’s Magazine. A few weeks ago I was confronted with an oddity that was a new one to me, even after working with the periodical for such a long time: two women with near identical signatures whom I was convinced were different people. Skiddaw, engraved by William Miller after J.M.W. Turner (1833). Over thirty years into the lifespan of the Lady’s Magazine most of the magazine’s popular fiction remained the work of the anonymous, pseudonymous or often unsigned contributions of the periodicals’ reader/writers. Much of the content serialized in the magazine after 1800 closely resembles those popular Gothic novels published –and, importantly – paid for by the Minerva Press. And as we continue with our research, we uncover more authors who contributed to the Lady’s Magazine as unpaid correspondents and were paid for their works elsewhere. One of the correspondents who would become a paid writer published first in the Lady’s Magazine under the initials ‘C. D. H.’ According to The Cambridge Bibliography of English Literature, 1800-1900  ‘C. D. H.’ is Miss C. D. Haynes, later Mrs C. D. Golland. Haynes published her first Gothic novel, The Castle of Le Blanc, A Tale, in serial form in the Lady’s Magazine from October 1816 through 1819. We’re very happy to be able to publish a piece by Holly Wright of the West Sussex Record Office exploring their recently-catalogued archive of materials relating to Anna Eliza Bray, which promises to be a really great resource for Romanticists. The papers of 19th Century author Anna Eliza Bray have recently been catalogued at West Sussex Record Office and are now available for researchers to access. The catalogue can be viewed via our Search Online facility at http://www.westsussexpast.org.uk/searchonline/. 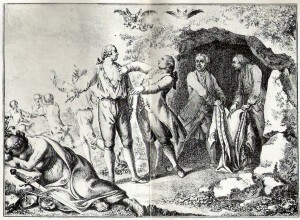 Frontispiece of Anna Eliza Bray’s book The White Hoods (Bray 3/2). Anna Eliza Bray (formerly Stothard, neé Kempe) was born on 25th December 1790 in Newington, Surrey and died on 21st January 1883 in London. She was originally destined for a career in the theatre; however, this endeavour was cut short as she fell ill days before a much anticipated performance at Bath’s Theatre Royal in May 1815, and subsequently lost the opportunity to appear on the stage again. The archive contains letters from this period between her mother, her brother Alfred John Kempe (the antiquarian) and theatre directors from Bath and Cheltenham. We continue our Romantic Imprints retrospective with a review of the special screening of By Our Selves held at Chapter Arts Centre in Cardiff during the conference. Many thanks to Erin Lafford of the University of Oxford for these thoughts on the film!